America may be more diverse than ever coast to coast, but the places where we live are becoming increasingly crowded with people who live, think, and vote like we do. This social transformation didn’t happen by accident. We’ve built a country where we can all choose the neighborhood and church and news show — most compatible with our lifestyle and beliefs. 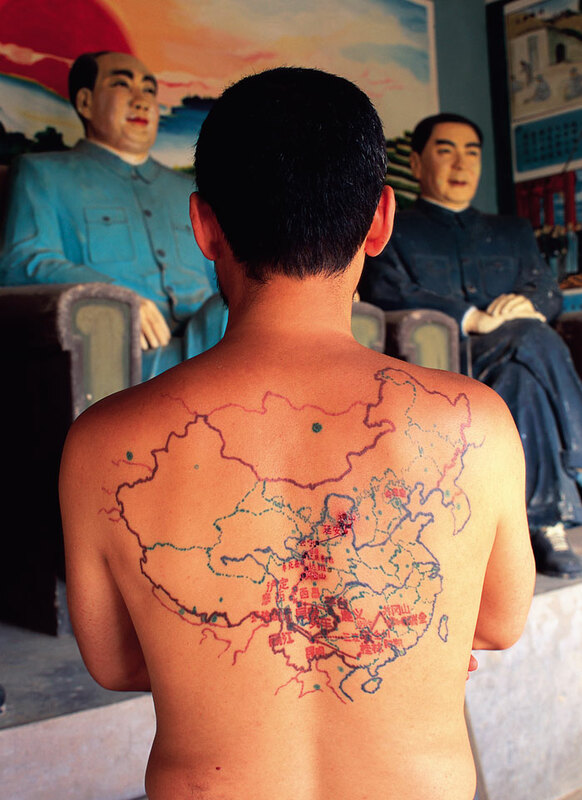 And we are living with the consequences of this way-of-life segregation. Our country has become so polarized, so ideologically inbred, that people don’t know and can’t understand those who live just a few miles away. The reason for this situation, and the dire implications for our country, is the subject of this ground-breaking work. 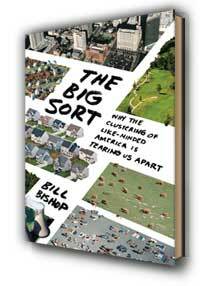 In 2004, journalist Bill Bishop made national news in a series of articles when he first described “the big sort.” Armed with original and startling demographic data, he showed how Americans have been sorting themselves over the past three decades into homogeneous communities — not at the regional level, or the red-state/blue-state level, but at the micro level of city and neighborhood. In The Big Sort Bishop deepens his analysis in a brilliantly reported book that makes its case from the ground up, starting with stories about how we live today, and then drawing on history, economics, and our changing political landscape to create one of the most compelling big-picture accounts of America in recent memory. The Big Sort will draw comparisons to Robert Putam’s Bowling Alone and Richard Florida’s The Rise of the Creative Class and will redefine the way Americans think about themselves for decades to come. Continue reading at TheBigSort.com . . . Create your political map and predict the electoral outcome! Think you know politics? Here’s your chance to prove it. Pick which candidate will get to 270 electoral votes and you could win the most competitive contest outside the presidential race. Full Contest Rules and Prizes. Enter the contest. 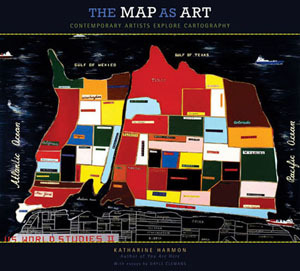 Sample map below. The fallout from Russia’s excursion into Georgia continues to be mapped by the news media (view graphic). 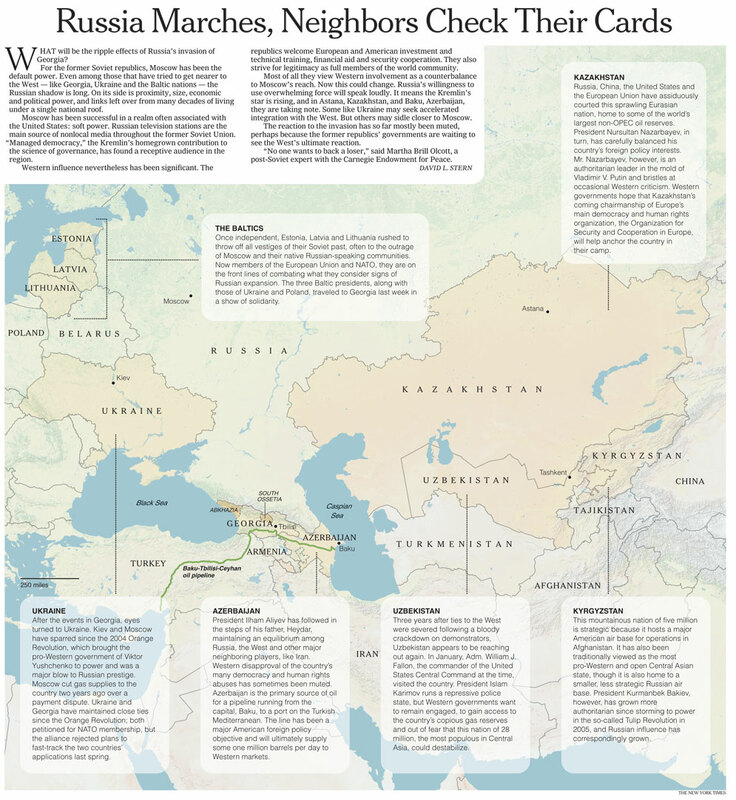 Today the New York Times features a map looking at post-Solviet power structures in eastern Europe and Central Asia where democratic and not-so-democratic regimes still feel Moscow’s shadow while being tugged at by the West. Continue reading at NYTimes.com . 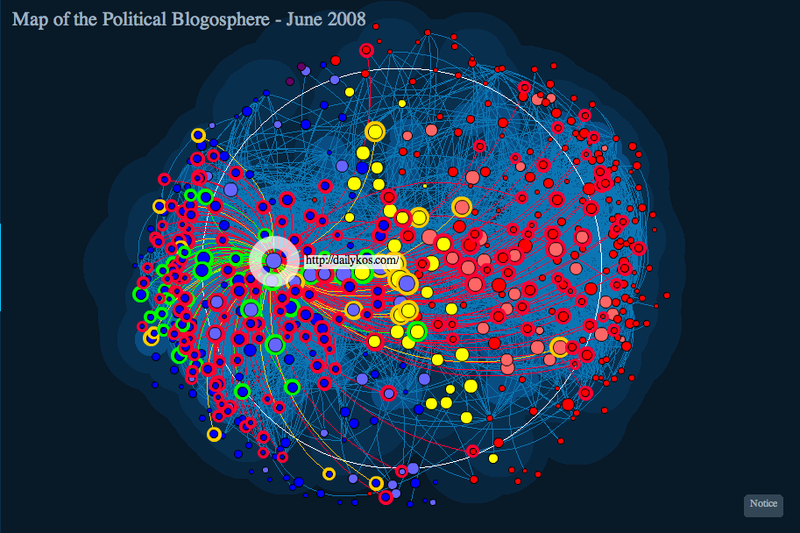 . .
I’m on a topology kick so today’s “map” shows the links between 533 different websites and blogs focused on the 2008 presidential race (view site here). 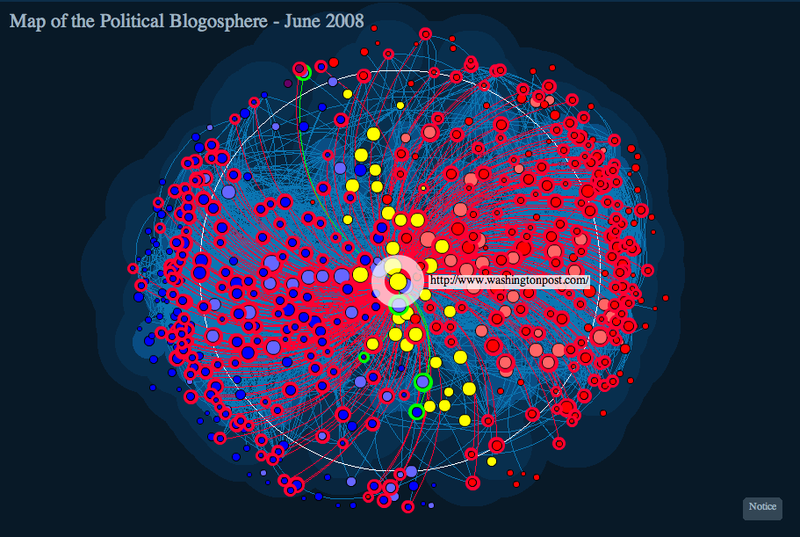 Produced by Linkfluence, this social graph theory based tool has both “map” and “trend” views. Each site is a node or “place” in the topology and anytime the sites reference each other or a candidate thru time a line or “edge” is drawn between the nodes. I find it ironic that the “liberal” media is actually quite centrist when compared to the liberal and conservative sides of the topology. Where is the debate happening ? What are the hot topics on the agenda ? Who’s making the news ? Who are the online community leaders ? Here are very simple and comprehensive ways you can answer these questions. 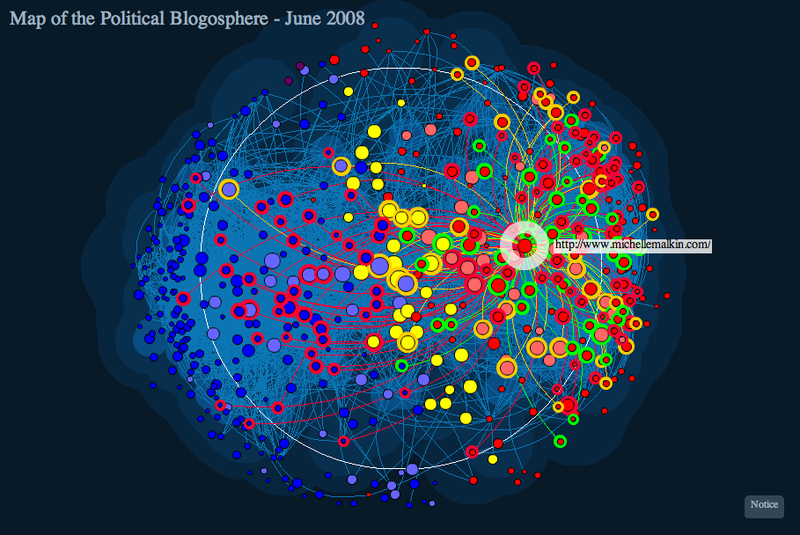 … Identify the true opinion hubs and shapers in the debate. (Presidential Watch 08).